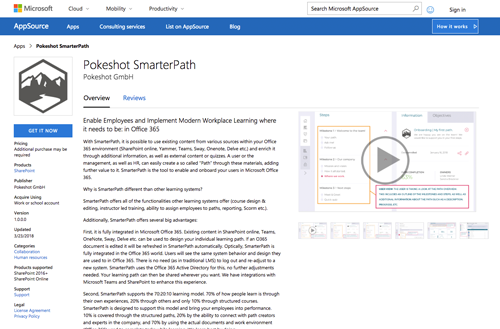 SmarterPath now also available in the Microsoft Marketplace! We are pleased to announce that our social learning solution SmarterPath is now also available in the Marketplace of Microsoft “AppSource“! SmarterPath is a software-as-a-service (SaaS) solution that connects social collaboration components with your employees’ daily work as well as their knowledge acquisition processes. As the Office 365 community continues to grow, there is a greater and greater need to structure knowledge and facilitate diversity. While vendors with traditional systems focus mainly on the 10% part of the 70:20:10 model, SmarterPath enables organizations to address the entire spectrum of learning activities. It is fully integrated into your Office 365 community’s work environment and allows users to continuing working with a familiar toolset – plus there is no need to change systems. Knowledge acquisition via SmarterPath doesn’t just consist of stringing learning content together – it enriches this content by providing context-relevant information from the entire community. As a result, learning stops being a one-off event and becomes an ongoing experience. Quick and easy installation of SmarterPath: Here you will find our installation guideline. SmarterPath is a Microsoft Trusted Product, so the software has been extensively tested by Microsoft and meets all common standards. You will receive a 30-day trial and will be able to use SmarterPath in your own Office 365 instance during this time. You will receive 3 pre-made paths from us to help you get started in SmarterPath. Hereyou will find SmarterPath in the Microsoft Marketplace.